The 'Peaks' were powered by the Sulzer 12LDA28 diesel engine. An electrical generator was coupled to one end which provided electrical current to drive the traction motors which were attached to the locomotive's axles. 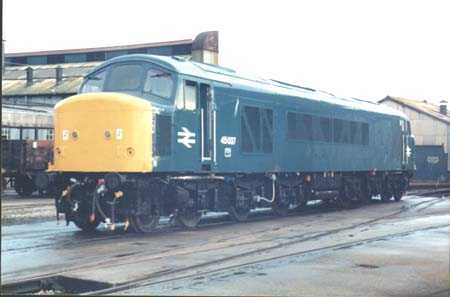 An example of the 12LDA28-B variant is seen (above) in Derby Locomotive Works prior to fitting in Class 45 No. 45013. The cylinders were arranged in two straight banks of six. 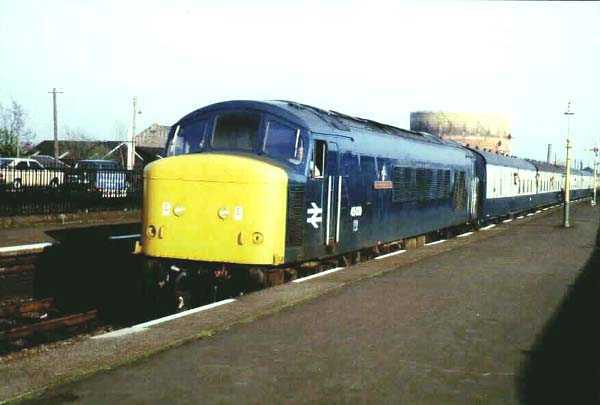 Class 45 emerged with several refinements over the ten 44s, not least an uprated Sulzer engine. here 45037 is seen in Derby Locomotive Works following a Heavy General Overhaul. Headcode panels were originally fitted to the nose ends, from 1976 these were replaced with the design shown on 45037. Next, an incredibly rare view of 45039 'The Manchester Regiment' at Stirling. The locomotive was working an unidentified football excursion on 20th May 1978.